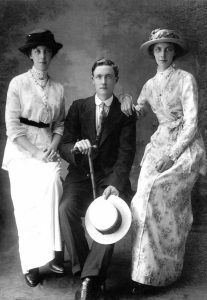 Cecil Bernard, known as “Nard”, with Ellen and Annie two of his sisters. Thornbury Museum. Cecil Bernard Symes was an Assistant Master at an elementary school before the war. He had a distinguished service record with the Royal Medical Corps. Cecil became an expert on malaria carrying mosquitoes before being discharged with wounds in 1919. Cecil went on to study entomology at the Royal College of Science. He then worked for the Colonial Office worldwide as a specialist creating the Entomological Section of The Medical Research Labs. A new species of mosquito is actually named ‘Anopheles Symesi’, after him. Mabel Emily Flux, of Walton Farm, Hambrook was a land girl. She lost two brothers and two cousins during the war. 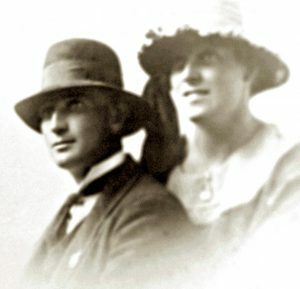 Mabel emigrated with her Australian sweetheart to a new life and became a pillar of local government. Awarded the OBE in 1960, she was described as ‘one who knows and loves the land, the people who live on it and the things that grow in it’.